The Cub Scouts program seeks to teach children, from a young age, morals and skills that they will carry with them throughout their life. 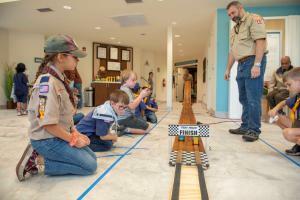 CLEARWATER, FL, US, January 24, 2019 /EINPresswire.com/ — On 19 January, 81 members of Cub Scouts Pack 43 gathered at the Clearwater Community Volunteers (CCV) Center for their annual Pinewood Derby, which teaches the young Scouts basic physics and woodworking skills. The Scouts learned these skills by creating the fastest, and most imaginative, cars from a simple block of pine wood alongside their parents before competing in more than 108 combined races for the grand championship. Before the race began, the Scouts recited the Pledge of Allegiance, the Scout Law, and Scout Oath before sitting around the racetrack. The derby was done in several stages where the winners of each went on to compete against each other in later stages. The final place winners were awarded trophies and medals. A larger trophy was bestowed on the grand champion before certificates were given to Scouts whose cars won in categories like most creative, best in show, or Scouts’ choice to recognize them for using their skills in craftsmanship. 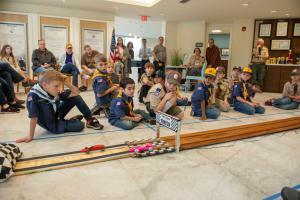 Pack 43 has been organizing the derby for 63 years, since it’s founding in 1953. The Pack has used the same racetrack every year, helping generations of Scouts learn basic skills. “The Cub Scouts program seeks to teach children, from a young age, morals and skills that they will carry with them throughout their life. Humanitarian and Scientology Founder L. Ron Hubbard said, ‘Of all the information which became important to me, such as photography, woodlore, signaling, and many other subjects, the basics of it was laid in Scouting,’ and it was great to see this in action,” said Michael Soltero, CCV Center Manager.